I've finally sat down and gave the Simple & SweetGeorgia Pullover some attention and love that it deserved. My hands still don't feel 100% but I'm determined to finish this project cause I want to wear it...NOW! 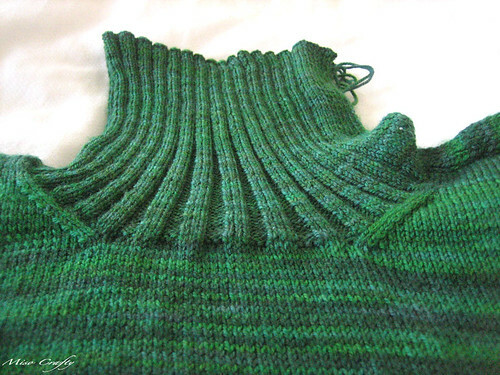 After spending quite a few knit nights working away on the neck ribbing (all 7 inches of it!) I finally got to bind off and start picking up the stitches for the right armhole ribbing last night. After knitting the 2" for the armholes, all that needs to be done is weaving in the (millions and millions of) ends and sewing on the buttons. The end is soooo close! I can see it now. I reckon that I'll have this bad boy finished and blocked by the end of the weekend. Eeee...I'm so excited! !